Accumulation of excessive nutrients from poultry litter applied to farms may result in a nutrient imbalance that can cause pollution. Using efficient feeding techniques can significantly reduce the nutrient content of excreted manure and help reduce odors and other gaseous emissions from manure. Properly managed poultry diets help balance nutrient flows and reduce the potential negative impacts some nutrients may have on the environment. Contact the local Soil Conservation District or University of Maryland Extension for assistance. Phytase is an alternative, economical phosphorous source and, as global phosphate reserves are not renewable, this is beneficial to their preservation. Moderate. During the past decade, the inclusion of microbial phytase in poultry diets has increased remarkably, mainly in response to heightened concerns over phosphorus pollution of the environment. The capacity of this feed enzyme to release phytate-bound phosphorus and reduce phosphorus excretion is now well-documented. None. This practice is integrator funded. Costs estimated as $ per animal unit of practice installed. Note: EPA estimates a net savings for phytase use. Therefore, their estimate is negative. MDA estimates $1,000,000 cost for 300,000,000 birds statewide at 250 birds per animal unit. 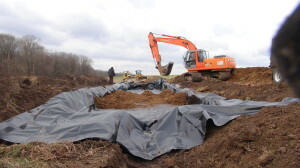 Managing poultry litter and diets will become increasingly important in the future because many U.S. states have chosen to address the nutrient flow issue by placing restrictions on land application of poultry litter to soils considered high in phosphorus. Soil type (sand vs. silt vs. clay) may have an impact on nutrient retention properties of soils and, thereby, application rates of poultry litter and commercial fertilizer.